So the thing about the August Break, is there are no rules. Whatever, whenever, without explanation if you want. I like that. But this warrants some explanation because I also have a question. 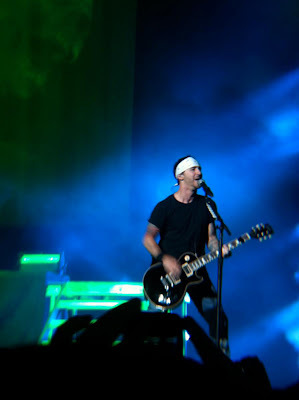 Here's Sully Erna from the Godsmack show last Saturday. I shot this with my iPhone and this handy dandy little telephoto lens you can attach. Got it from here. And it works way better than the digital zoom from the app I have on the phone. Anyway, so this is the closest I've gotten to "shooting" a concert. I really would love to shoot a show at a large arena with the BC (Big Camera) but I cannot seem to get a way in. Now that said, I haven't really put my mind to it 100%. And I think when I do that it will happen. But here is my question ... I have asked two people in the last few months that had press passes at shows how they got them and you would have thought I was asking for President Obama's email login. Jees, what is the big secret? Why all the mystery? These two women were not rude but they were definitely defensive about their press pass and neither really answered how they got it or wanted to share. One of them actually knew my name and when I asked her how she knew me, she skirted the question. Huh? What? Just tell me, you've seen me somewhere or you know so-so that knows me. Jees. Anyway, I'm the type of person that if I have knowledge I'm open to sharing it. There's plenty of opportunities for everyone. And what you give out comes back to you. So if anyone has tips they are willing to share ... I sure would love to get in somehow to shoot some cool shows. I brought my D40 into a smaller venue (apx 800 capacity) show by just brining it. It's not SUPER huge and I didn't have a massive zoom lens attached to it but everyone was surprised they let me bring it in. If you can get close, you can still get some good shots. I don't know about a press pass but if you have a smaller SLR you might just give it a whirl?